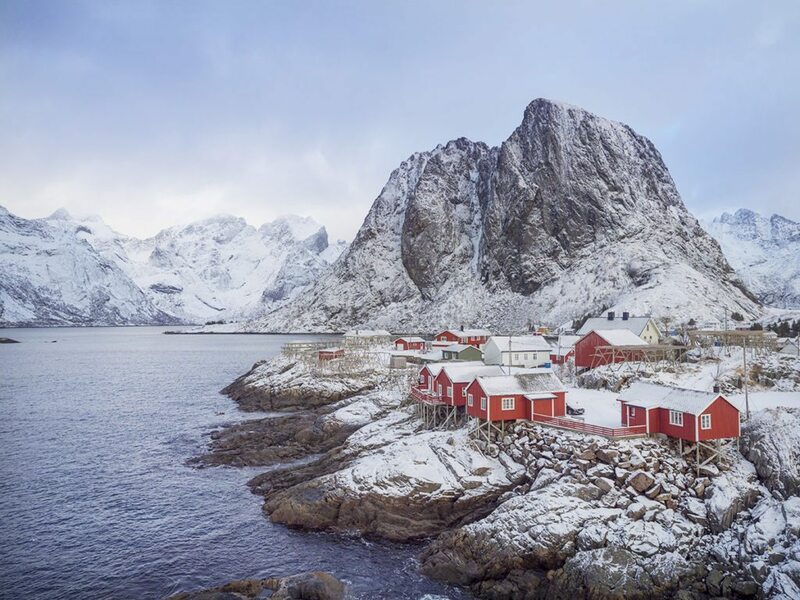 Where to go in Europe for amazing winter photos! There’s a chill in the air, snow in the mountains and magic in the sky. Winter is perhaps the most photogenic season in Europe and by far my personal favourite, offering a variety of landscapes formed by dramatic weather conditions. Photographing winter scenery is a constant buzz of excitement, anticipation and fleeting opportunities filled with total photo perfection. Once you’ve experienced an Aurora hunt, snow storm and editing session by the fire after a long day outdoors it becomes an addiction. A never ending adventure to photograph the perfect northern lights display, a charming village square at Christmas filled with twinkly lights or an alpine wilderness that feels like you’re a million miles from anywhere. There’s something about gearing up to face the elements, heading out to photograph the unknown and waiting for the conditions to line up. Summer can be a little predictable but winter is most certainly a total contrast, not just where temperatures are concerned. With castles, volcanoes, glaciers, waterfalls and the Alps; Europe over delivers when it comes to winter photography locations. Below I’ve put together a guide to some of my favourite destinations that I’ve been lucky enough to photograph over the past two winter seasons. Here’s a map to where they are located and if you’ve got somewhere photogenic to add to the list, I’d love for you to comment at the end of the article and share it! The Arctic Sea meets an endless landscape of steep peeks rising from frozen shores. Norway’s Lofoten Islands are filled with dramatic scenery and each year photographers flock to the region to capture its natural beauty. It’s a popular destination for Aurora hunters but if you’re into coastal landscapes, this is THE place. The island chain stretches west from Norway’s northern coast and linked by bridges, forms one of the best road trips you can take. In winter conditions can get quite sketchy with wild seas and snow storms closing roads. That said, it’s also the intense weather that makes a trip here in winter so special. You might get stuck indoors for three days straight but that one hour you get outside could be all you need to create an absolutely stunning image. A gnarly (clearly I’m cool) surfer hangout with a long beach break that curves beneath a cliff face. In winter the rocks are covered in snow and contrast beautifully with the aqua brilliance of the freezing waster while surfers in steamers carve up the waves. 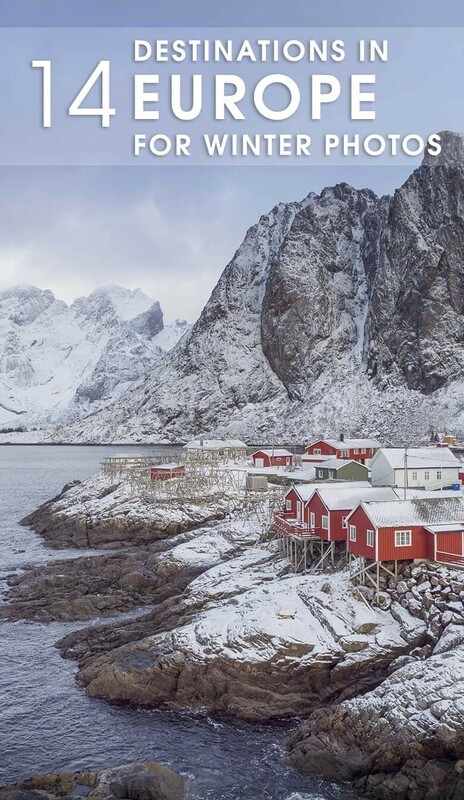 Perhaps the most photographed scene in Lofoten, the red cabins of Eliassen Rorbuer are somewhere you need to see to believe. The landscape will take your breath away. I’d recommend visiting this spot a few times in winter as the weather changes so quickly it can look completely different within a few hours. Hattvika Lodge is one of the best bases you can have while exploring Lofoten with the owner Kristian an expert on where to go to capture the best photos. 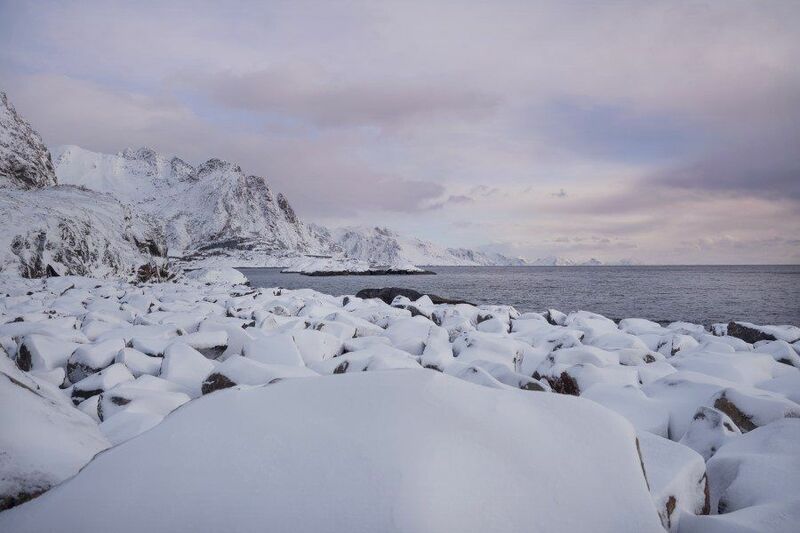 From the lodge you can photograph trawlers returning from the wild sea with a fresh catch, zoom in on the snowy horizon of Norway’s mainland or hike to the peak of Nonstinden. Read my visual review of Hattvika Lodge here. Click here to read the full ‘Photography location guide to the Lofoten Islands‘. 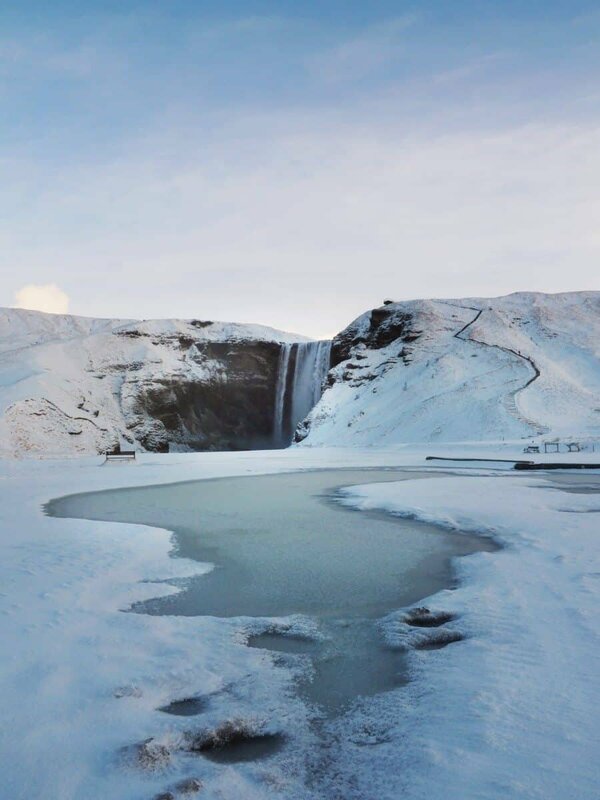 Now one of the most popular destinations regardless of season, Iceland attracts photographers for a very good reason. It’s spectacular. It’s an island nation filled with so much natural beauty it would take a lifetime to explore. 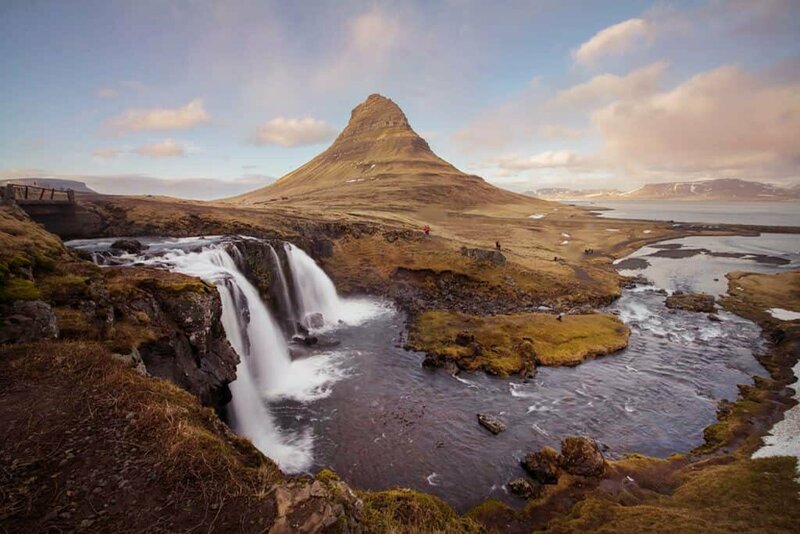 From waterfalls and glaciers to volcanoes and ponies coiffed to perfection, Iceland will blow your mind. If it doesn’t, then it’s you, not Iceland. Iceland is perfect (in my opinion). For solo travelers it’s a country where you can feel completely safe driving from location to location with your camera. If you’re part of a group keen on capturing the best landscapes, it will no doubt be the trip of a lifetime. And winter, in my opinion, brings out the best Iceland has to offer. It’s rugged, wild and unpredictable. Don’t come to Iceland with a planned itinerary in winter because it’ll no doubt be interrupted by crazy storms, gale force winds and road closures, but that’s all part of the fun. The road system is completely prepared for the winter weather with websites like road.is and Veður.is publishing live updates and colour coordinated guides to help you decide on a safe route. But that’s the boring bits to talk about now…let’s get onto the best spots. Click here to read my guide to Iceland’s South Coast Photography Locations and then also here for Photo Spots Around the Snaefellsnes Peninsula. One of the first spots you’ll come across when driving the southern route towards Vik and Jokulsarlon Glacier Lagoon, Skogafoss is a gem. For some reason it reminds me of a toaster but it’s square formation looks like how I’d imagine the definition of a waterfall should. Thundering water pouring over the edge of a cliff with rainbows and seagulls dancing in it’s mist. It is popular so it’s best to time your visit for sunrise! Read more here. Even though it can be crowded, this place is my favourite spot in Iceland (so far!). 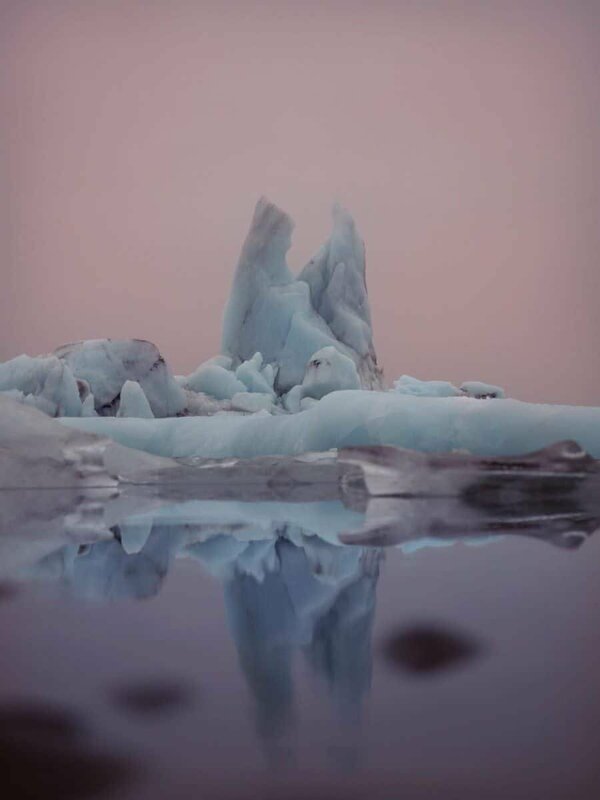 Icebergs float throughout the lagoon as seals bob up and down and the sound of crackling ice can be heard amongst the stillness. Sunrise here is simply an experience and standing on the shore at night waiting for aurora is like being in another world. The sounds of silence here are incredibly loud and overpowering for the senses. Read more here. Experiencing the glistening beauty inside an ice cave is like entering another world. Forming anew each year the ice caves of Vatnajokull are carved by waterfalls that run through the glacier. Read more here – Photographing Inside an Ice Cave. Located on the Snaefellsness Peninsula, this gem is so photogenic, you can capture it from almost any angle. The mountain Kirkjufell is like a witches hat resting on the shores where orcas cruise by and aurora dances above. Across the road from the mountain is Kirkjufellsfoss…the waterfall, which is what you’ll see most photographers capture when they visit this region. The waterfall has a few levels so be sure to cross the bridge and explore a little for varied compositions. While I personally haven’t visited this region in winter, it looks like the ultimate adventure for both photographers and keen winter addicts. If you’ve got the right equipment and local knowledge that is. Check out Chris Burkard’s video showcasing the region in ‘Under an Arctic Sky‘, possibly the best adventure/photography video I’ve ever seen. 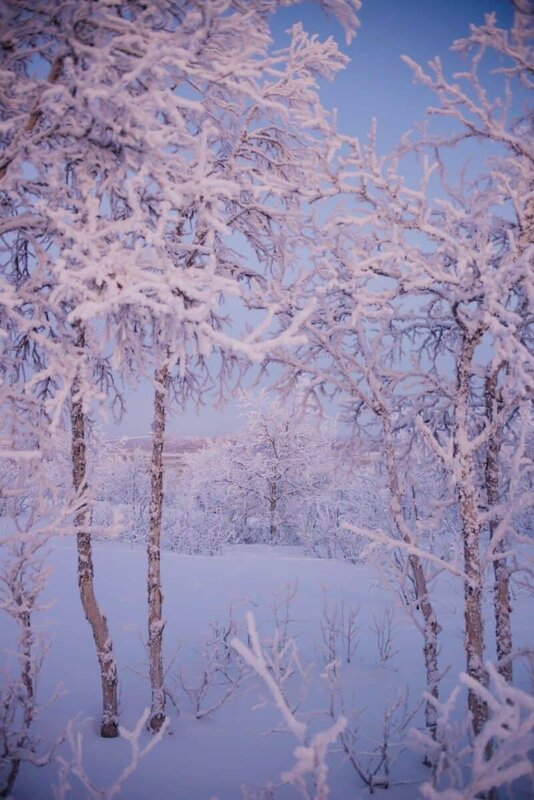 Forests filled with snow covered pines, frozen lakes and a sky filled with magic awaits in Lapland. Like wandering inside a snow globe, the region is a photographers dream…provided you’ve got a warm jacket to keep you cosy outdoors! 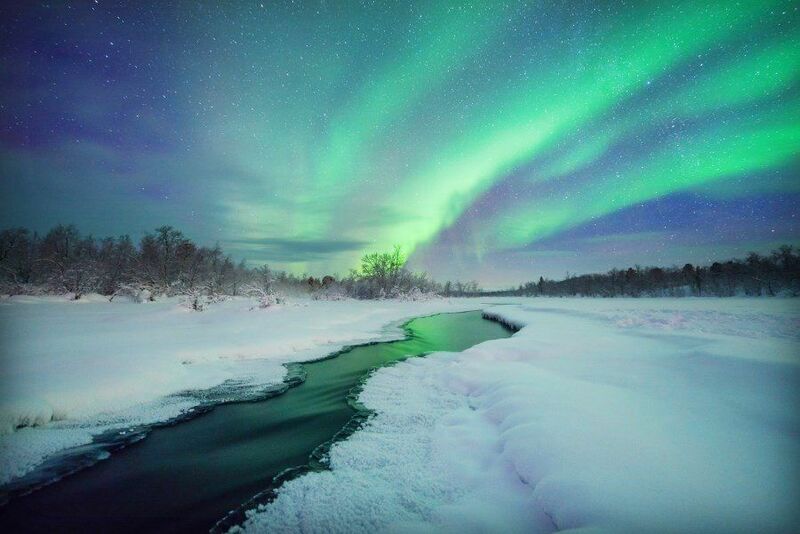 Across Scandinavia the lapland regions offer the ideal place to watch for northern lights during the dark, winter months. With the lights visible from early September until late March, there’s plenty of time to visit and witness the magic. Visiting in winter however provides that extra wow factor. White landscapes covered in deep snow, trees lined with a constant layer of sparkling frost and some of the coldest conditions you’ll likely ever experience. On my visit in early January temperatures were hovering around -35 degrees…dropping to about -46degrees one night while I was out photographing aurora. It sure is cold but it’s an experience I believe that if you can get there, it’s so worth your eyelashes freezing together. It’s probably best to have a guide when visiting this location but it’s worth it. The frozen Laukkujarvi creates an ideal base for your tripod while you wait for the northern lights to dance. You’ll find wooden cabins throughout the woods and with a guide will be able to get access and warm up with tea or capture it’s atmosphere. Read more here. Every time I describe this forest I really can’t say it any other way. It’s like walking in a snow globe; a freezing cold, real life shaken up globe of winter perfection. Tree branches are covered with a sparkling layer of frost and the dusk skies of winter compliment the scene beautifully. You’ll find the park entrance just behind Camp Ripan, also the perfect place to base yourself whilst exploring the region. Read more here. In the winter months this frozen wilderness is alive with activities. From dog sledding to reindeer encounters, traditional Sami culture and of course the infamous Ice Hotel. Your camera will be more than happy to snap it’s way around this area, be sure to check out my guide to camera care in extreme conditions though! 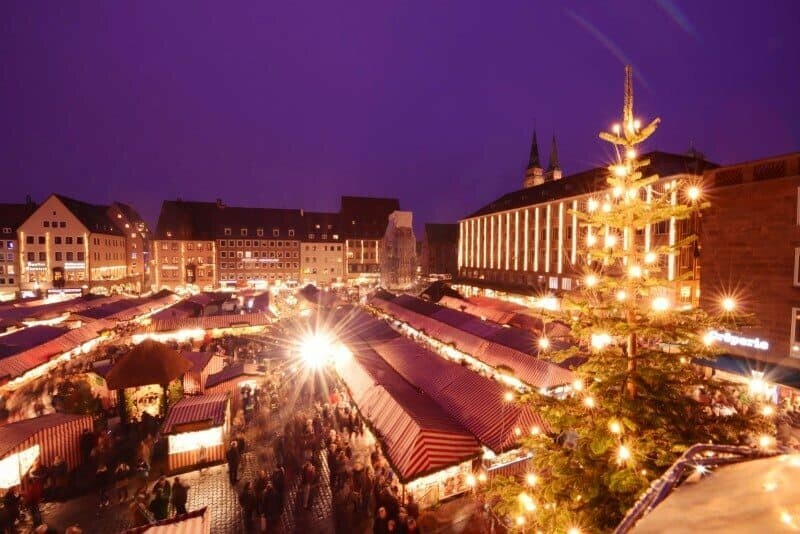 Winter time in Germany means one thing…Christmas Markets! Well, it probably means more than one thing but if you’re into photographing village squares, atmosphere and fairy lights, Germany is your place and winter is the time. Throughout December most villages and cities will have at least one Christmas market, some will have multiple and they bring all the festive spirit, glow and mulled wine with them. Take a peek at my Christmas market cruise for more details otherwise below is my pick for winter photography locations. Visiting in winter typically means less crowds and more snow, which for photographers is the dream combination! 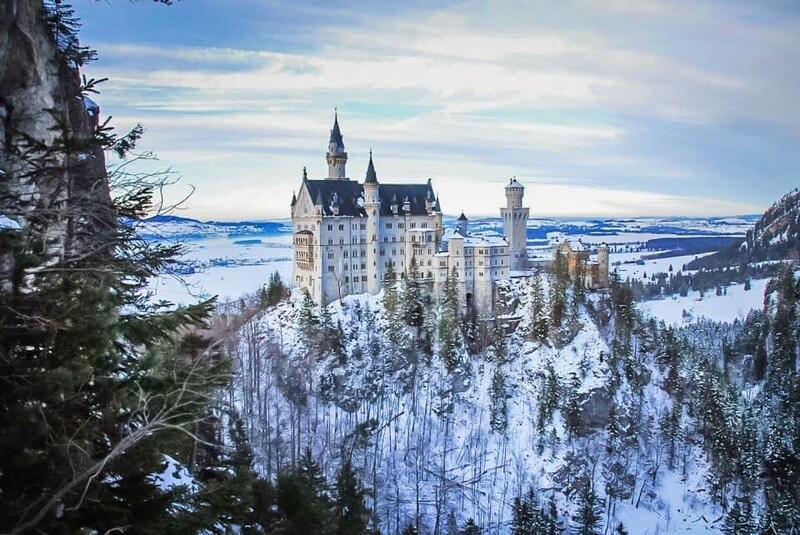 Looking like the Disney logo come to life, Neuschwanstein Castle is every bit the fairy tale. Personally I found the exterior much more impressive than the interior and behind the castle you’ll find the immensely picturesque Lake Alpsee. In winter it’s shores are covered in snow and the reflections of forest and lake cabins is worth at least a few hours of your time to explore. Read more about the fairy tale village of Hohenschwangau here. Of course if you can ski, Switzerland is one of the dream destinations where the slopes are primed and ready for your downhill skills to be unleashed. If, like me, you fall over just hearing the word ski, there’s plenty of photo spots to keep you happy too. Last winter I checked the forecast waiting for a snow storm to turn this lake into a winter wonderland. The lake is already quite popular with visitors who flock to see it’s bright turqouise colour, believed to have been created when the tears of a local woman fell into the lake. 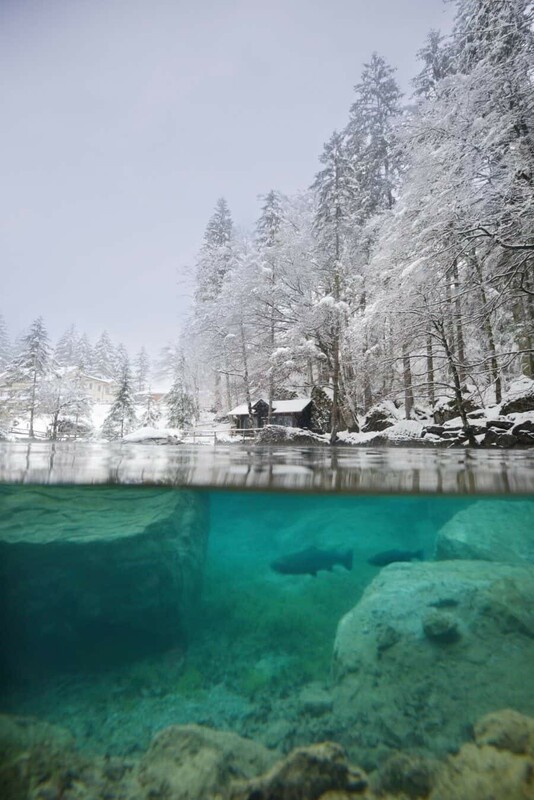 For the full story you can read my article ‘Behind the Lens: Lake Blausee, Switzerland’. Photo wise though, this lake is crazy beautiful. With clear teal water, alpine forests and a gorgeous little cabin and hotel it’s worth spending an entire day here with your camera (and a friend…but mainly a camera!). 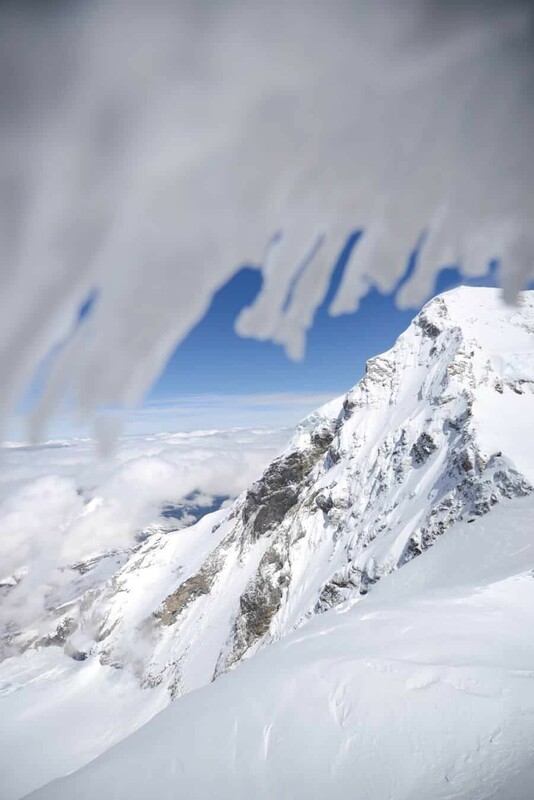 If you’re looking for a base in Switzerland, the Jungfrau Region is it. With places like Wengen, Grindelwald, Kleine Scheidegg and Jungfraujoch all linked by train, it’s ideal for photographing a variety of alpine landscapes. Read my guide to the region here with lots of detail on transport, where to stay and the best photography locations. So, after reading about these 14 spots, how many have you visited? Or…do you have somewhere beautiful to add to the list? I’d love for you to comment below and share your favourite winter destination in Europe and why it’s great for taking photos! You’re welcome to leave a link to your own blog post or photo on Instagram so we can see what makes it so photogenic. Great to hear Melissa! Have you decided on somewhere yet? Oh my! 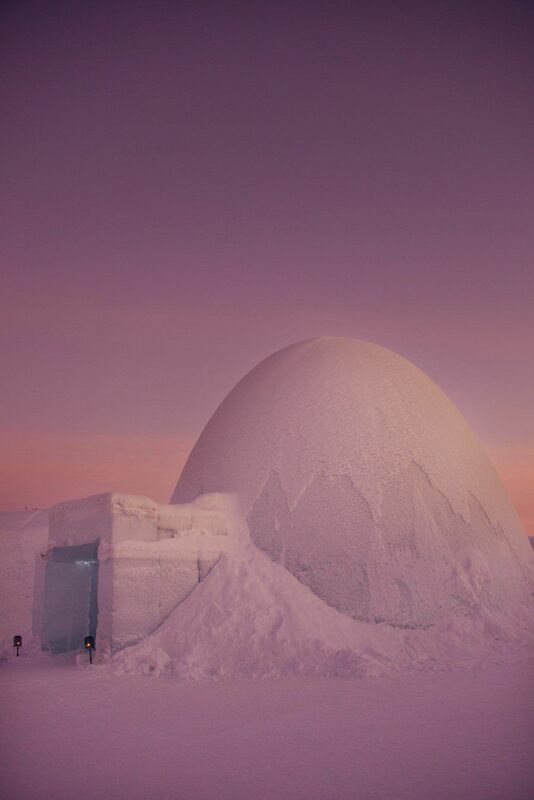 These places really do look amazing during winter! I visit most of the places that you’ve mentioned in the Summer, so looks like I’ll have to go back during winter! Not a bad excuse to go and revisit some amazing locations again to see them in another light! I’m getting such snow envy from this post! (is that a thing?) Thanks for sending my wanderlust into overdrive! Haha!